I'm going to try an experiment, one that hopefully won't get me into any serious trouble. There's a book that is pretty darn neat, but is out of print. Because of its unattainability, the people that do have copies try to sell them for anywhere between $200 and $500. This is unacceptable. There are many people who have written the publisher asking for another printing run, but they refuse to do it. I think that it might actually be them periodically releasing copies into the marketplace at at least 200 times the cover price. This is unacceptable. So herein lies my experiment: I'm going to post a crappy scan of the book (which has been easily attainable in the deeper darker scarier parts of the internet for quite some time now anyways) and see how long it takes before I get a cease and decist letter. I don't think I get enough hits to really worry too much, but I am a little bit paranoid anyway. My hope is that some of the people who want to read the book badly enough to pay the asshats who only have it so they can sell it for huge amounts of money will be able to find it without breaking the bank or supporting those that inflate the value of things. 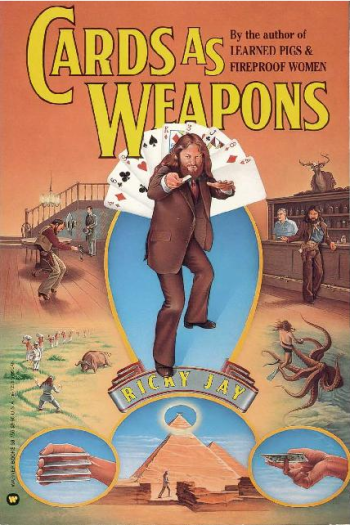 Ricky Jay is an amazing magician and his card throwing technique is simply amazing to see. With this book, you too can learn to be somewhat closer to his level of expertise. Sadly the scan job is of a less than desirable quality, otherwise I would have run this through OCR and made a nice readable text version. Note to pirates: if you are going to go to the trouble to scan in a priceless book, please do a good job of it and spend the time to format it in a manner that doesn't require a PDF viewer. Thanks.